Bronze is a metal alloy consisting of copper, usually with tin as an additive, but is also mixed with other elements such as aluminum, manganese, phosphorus and silicon. Bronze is often used in the manufacturer of bearings, bushings, washers and wear plates because bronze has very little metal on metal friction. There are standardized cast bronze bearings (CB) available from stock at all Bearing Service locations. 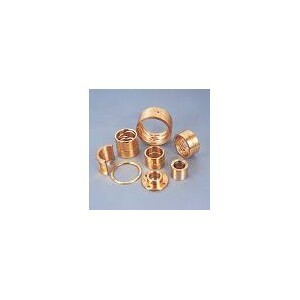 Cast bronze bearings are machined from C93200 (SAE660) bronze. The casting process allows a uniform bronze structure and eliminates porosity. Bronze is also available from solid or cored bar stock to allow for customer machining. In addition to standard bronze sleeve bearings and bar stock.